The kitchen is often hailed as the heart of the family home. A warm, welcoming place where people gather together to eat and socialise. Or, it can be a room devoted to state of the art design, beauty and functionality. However you like your kitchen to look, it’s one of the rooms in your house which doubtless you’ll want to enjoy. So, if you’re thinking it’s about time you invested in a new one and you’re looking for some kitchen design ideas, Leicester is the place to be, because at Dewhirst Kitchens, our Granby Street showroom has a selection of the very best. Kitchen design ideas are a very personal thing and at our Leicester showroom, our team of talented kitchen designers, know how to listen to your ideas and have some of the perfect solutions and software to help turn them into stunning reality. First, for your kitchen design ideas, why not come visit our showroom and have a look around? We’ve got lots of stunning kitchens on display, beautifully laid out over three floors, for you to take a wonder around and grab some inspiration. Or maybe, you already have some kitchen design ideas of your own and would like some help putting them into practice? Feel free to ask a member of our in house design team questions about our products and how we work, maybe even book an appointment to sit down with one of our consultants and go through your plans. We can either do this with you at home, on site, or in our showroom. You will be asked questions which cover every aspect of your new kitchen, from your ideas for furniture and appliances, to worktops, materials and colour schemes. Once our skilled designers have a comprehensive idea of what you want from your dream kitchen, they’ll put a lot of time, thought and effort into achieving a perfect result just for you. 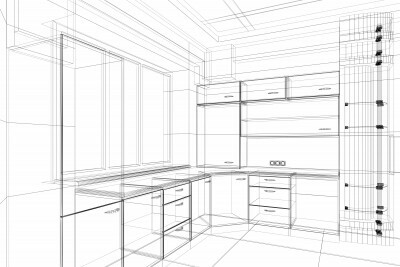 Using computer aided design software, they will create photo real perspectives to design your beautiful kitchen, then present the initial design to you, with detailed plans, perspectives and a fully itemised quotation. At this point you will also have the chance to develop the design, discuss alterations and make your final decisions, before your dream kitchen starts to become reality. If you’re looking for a beautiful new kitchen and would like to be a part of the design process, give our Leicester showroom a call today. We pride ourselves on being able to make your dream kitchen design ideas a reality that we know you’ll love.